MAKE SURE YOU VISIT OUR FACEBOOK PAGE AND CHECK OUT OUR NEW CAPTION CONTEST! IT RUNS UNTIL JUNE 29TH. WE’VE POSTED A PICTURE AND ALL YOU HAVE TO DO IS WRITE YOUR OWN CAPTION AS A COMMENT ON THE PHOTO AND LIKE OUR PAGE. THE FUNNIEST AND MOST ORIGINIAL CAPTION WILL WIN A MASTER CHEF 680 sq. in. 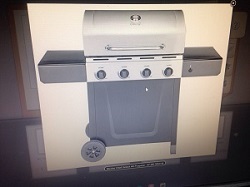 BBQ WITH 48,000 BTUs VALUED AT $250 FROM THE GLACE BAY CANADIAN TIRE STORE. DEADLINE FOR YOUR POST IS 12 NOON ON THURS, JUNE 29TH. WINNER WILL BE ANNOUNCED ON FRI, JUNE 30TH DURING THE MORNING SHOW.